Unfortunately I have missed out on the first “Synchronbacken” of this year, but nevertheless I wanted to try the recipe the girls have chosen. The rolls came out great! I am really amazed and I’m going to try the salt-yeast method on a lot of bread recipes for sure. I’m a huge fan of letting the dough rest for a long time in the fridge. That’s mainly because I’m just too lazy to do the dough in the mornings 😉 Sometimes being prepared can save your day. So, let’s move on to the recipe! For the main dough you mix the two flours in a big bowl. Then you put in the salt-yeast solution, water, barley malt and margarine. Now you mix it all up with the dough hook until a nice and smooth dough forms. Therefore it must be kneaded for 8 minutes on low speed and then another 6 minutes on average speed. Then you cover the dough with a canvas and let it sit in the fridge overnight. After that you cut a cross in your rolls. Next you put them in the oven and pour boiling water into the preheated bowl. 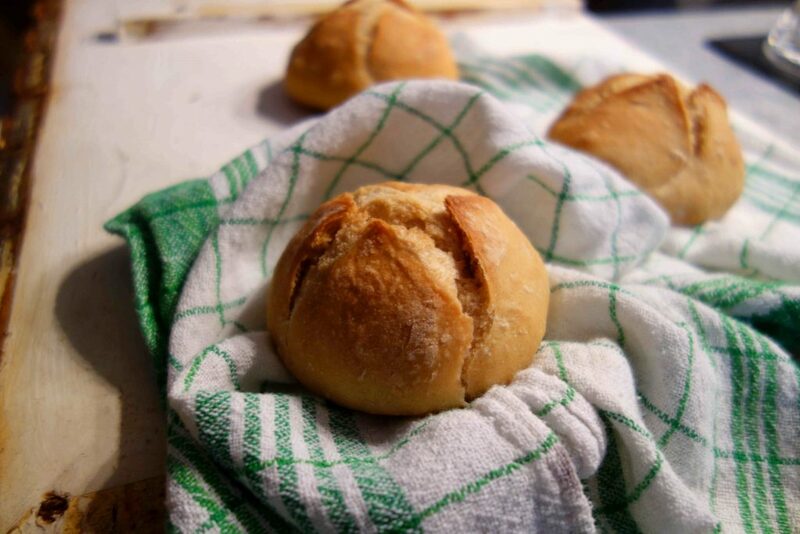 Bake the rolls for 10 minutes with steam and then open the door of your oven for approximately 20 seconds to let the steam come out. Then you bake them for another 10 minutes until they are golden brown and crispy. Take them out of the oven and let them cool for a few minutes, before you enjoy them for breakfast.